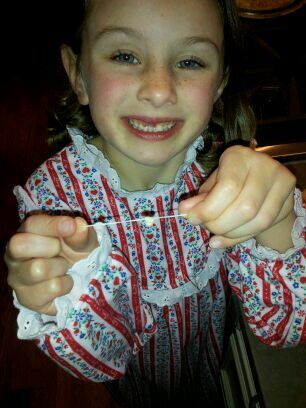 This picture and dialogue comes from a mom whose little girl’s tooth was loose, but did not want to come out! Dr. Bloom: You should get a piece of floss, and tell her that you are going to clean around the tooth. Wrap the floss around the tooth and pull the knot closed. If the tooth still does not come out, you can tell her that her tooth is clean, and that it will come out within a few days. Don’t worry. It is normal for a tooth to take several days to come out. Mom: The floss trick worked like a charm! Dr Bloom: Just call me the online virtual dentist :). Have you ever tried this trick before? Do you have any other suggestions for getting those stubborn primary teeth out?